The Construction and Housing Ministry announced Wednesday that it has authorized the construction of a new neighborhood in east Jerusalem. The ministry has requested the Israel Land Authority to allocate a 150 acre stretch of land near Atarot, an area in northern Jerusalem, where the majority of residents are Arabs. Whether the new neighborhood will be housed by Jewish or Arab residents has yet to be decided. Should the neighborhood be built, it would be one of the largest ones built by Israel in east Jerusalem. The intended location is geographically closer to the West Bank city of Ramallah than it is to Jerusalem and abuts the intended route of the separation fence. Furthermore, should a Jewish neighborhood be built in that specific location, it may impede any future plans to divide the city. News of the Construction and Housing Ministry's plan were first published by Haaretz Daily Newspaper. Following the report, the Housing Ministry denied it has plans to build an all-Jewish neighborhood in the area, citing instead that it is looking into building an all-Arab neighborhood, which may ease east Jerusalem's over-population problem. "Even if this plan materializes, we're talking about the far future, some 10 years from now," a source in the Housing Ministry told Ynet. "We have no real plans defining its nature." Housing and Construction Minister Ze'ev Boim, stressed the source, has nothing to do with any private, commercial or political initiatives that may try to push for the construction of an all-Jewish neighborhood in the area. "Jerusalem's future development is one of the most burning issues we are dealing with," said an official statement by the Housing Ministry. "The city is expected to house some 950,000 residents by 2020 and in order to meet their needs we have several major construction projects in the works and are looking into the available land reserves." Yehoshua Polak, deputy mayor of Jerusalem and head of its district planning and building committee, told Ynet he sees no problem in building all-Jewish neighborhoods in east Jerusalem. "Atarot is most definitely within Jerusalem's city limits… there is no reason not to use the land to build housing projects for newlyweds." 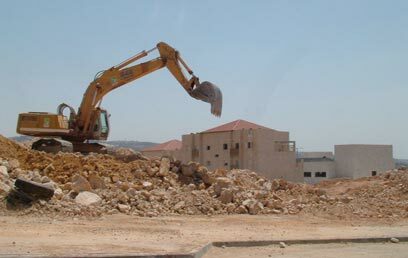 See all talkbacks "New building projects planned for east Jerusalem "